It was a meeting of two expectant mothers, one old, one young. One was six months along; the other, newly pregnant. Both of them were pregnant when really neither one of them should have been, under normal circumstances. But these circumstances were anything but normal. ”The Visitation” is the term that is commonly used when referring to this meeting of these two most uncommon mothers, Mary and Elizabeth. A woman‘s discovery that she is going to have a baby remains a defining moment in her life. For some, it is a glorious fulfillment of hopes and dreams. For others, it is an unexpected and frightening event, a source not of joy but of terror and massive disruption. 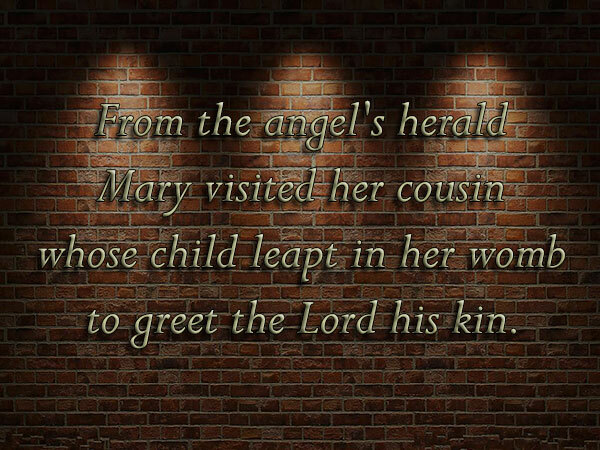 After the angel Gabriel turned her life upside down, Mary needed the counsel of someone she could trust, someone who might mentor her and help her understand God‘s great challenge for her life. Her cousin Elizabeth was the perfect person to do that, for she was a kind, older woman who could speak to Mary the words of wisdom and encouragement she needed to hear. Although an older woman, Elizabeth was also expecting a child, the child that would become Jesus‘ cousin, John the Baptist. These women had no wealth or social standing; nothing about them was remarkable. Yet God chose them to be his instruments for bringing into the world two men who would shape the faith of humanity and change the course of history. The key to this story is that it is not just a meeting of the two moms. They had faith secrets and faith promises and needed each other. Faith is personal but not private We do not go with God or to God on our own. Faith shared brings life. The visitation gives an example of faith and joy shared.